There is a possibility that while working in the company one might face some sort of official or personal accusation against them regarding some verbal and non-verbal behavior. And to handle those accusations in the workplace a person need to understand those accusations first and then react to those matters of workplace accusation with a valid answer. Therefore, to overcome workplace accusation a person who is being accused need to think before taking any actions against those accusations. Accused of Wrongdoing at Work: What to Do? Experiencing a communication difference in the workplace is a common thing in everyone’s life, but sometimes these communication difference go to a level of arguments and people start accusing each other with reasons or without reasons. Therefore, during such time a person needs to be calm and handle such issues. 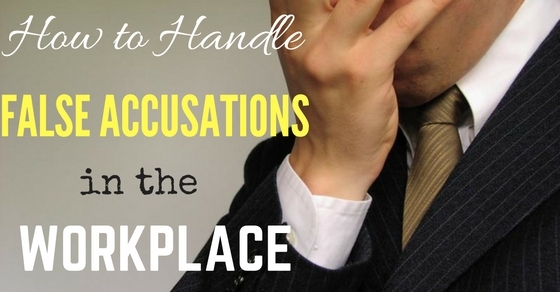 Below mentioned are few ways to handle the accusation in their workplace. Sometimes people mess things up by just getting angry when some sort of unnecessary things come up. Therefore, instead of taking things in a wrong way a person can gather himself and stay calm during such accusation in the workplace. Staying calm can help them understand the situation better even if it is uncontrollable. Therefore, it is advisable to most of the people who face workplace accusations that they need to think straight and stay calm. Most of the people lose control during irrelevant accusation in the workplace. And to handle such situation a person who is being accused need to be calm so that he can be stay focused during the settlement. Or else the accuser and accused can present their side of the story with some facts in their hand. Especially when it comes to company working environment the management believes in facts more than words. Therefore, it is better to stand for themselves with relevant facts on their side. Before jumping into conclusion the accuser and accused need to understand the plot first. Especially the accused need to understand the situation better to confront the reasons behind those workplace accusations. Therefore, it is important for the accused that before making things worse, he should study all the details about the accusation made by the accuser. And then try to take actions against that accuser with proper proof on his side. Once the accusation is made and the accused confronts all sorts of details regarding these accusations, then the first thing he should do is to find people who can help him and get him out of this accusation mess. Therefore, it is advisable for all the accused that whenever one of your colleagues blames you for some things and try to blame for unnecessary reasons, then they should reach out for those people who trust them and can help him no matter what. It is a most common saying that people keep following in their life that to solve some issues or mistakes a person need to believe in forgive and forget policy to move on in their life. Therefore, whenever there is an issue or an accusation in the workplace, that issue can immediately get resolved between the accuser and accused, if the accused forgives and forgets the accusation to be normal in their professional life. Whenever a person faces some sort of issue with another person and after a while if that issue gets resolved and they forgive each other’s behavior during that issue, sometimes that behavior still stays in their life as they keep meeting that person. Therefore, it is advisable for all accused people that once they clear out all the doubts with another person, then they should take a step and start fresh with that person to rebuild their relationship in their workplace. Whenever a situation comes where in which a person receives an accusation which is completely unnecessary, then after a while that accusation gets resolved soon. But there is a possibility that because of unnecessary accusation an accused can get hurt and lose his self-esteem. Therefore, to overcome that situation a person needs to invest in their self-esteem by re-building their own trust on themselves. Sometimes people working in the office may not be aware of their legal rights in their workplace. And there is possibility that whenever such unpleasant scene comes in their life, they get stuck in middle of that because of that unawareness. Therefore, it is necessary for each and every employee working in the company that they need to be aware of their legal rights which can help them overcome any sort of workplace issues. A person need to handle accusation in the workplace in a calm and composed manner. Similarly, along with that an accused need to cooperate with their official when they try to investigate the truth behind the accusation. Therefore, it is most important to cooperate with departmental assistants if the person who is being accused is an innocent one. Moreover, situations get controllable once the accuser and accused cooperate with the investigating team. Finally, the bottom line is that receiving some sort of negative accusation in the workplace is a common thing. But people lack in with their problem solving techniques when it comes to resolving such accusation level of issues. This discussion helps a reader understand all ways using which a person can handle accusation in the workplace even better. Therefore, if anyone interested to know more about the techniques to handle false accusations in the workplace, then they need to follow all the above mentioned ways to come out clean from such level of mess.